You love spending all the free time you have enjoying your endless passion of sewing and dressmaking, but you find that you are missing on spending more quality time with your children because of your hobby? 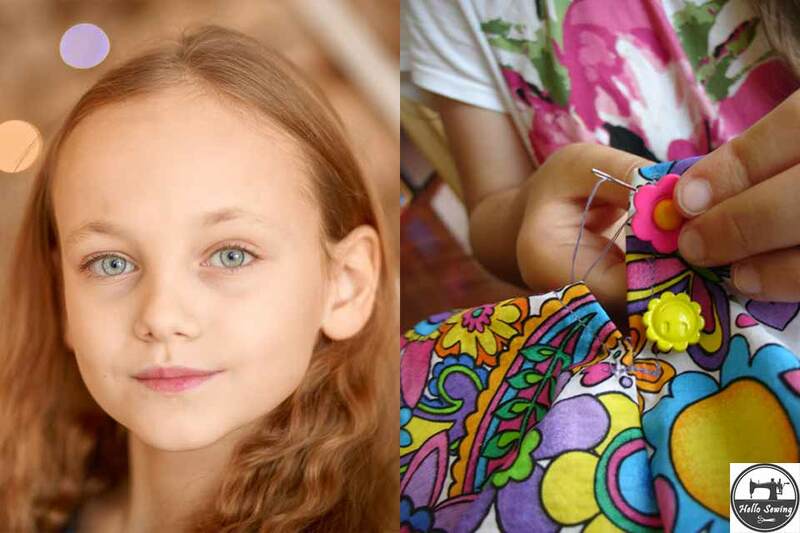 Why not get your kids involved and teach them the art of sewing, so that you can do both at the same time? If you think that you child is too young or cannot be interested in sewing, here are some ideas and tips based on the most common questions that I receive from parents about sewing with kids which will help you through the process and keep your young ones interested at the same time. 1.1 When can your child begin learning how to sew? 1.2 Should you get your child a toy or the real thing when introducing it to the basics of using a sewing machine? 1.3 What kind of sewing machine is suitable for children? 1.4 What are the sewing terms which the child should learn from day one? 1.5 Which stitches should the child learn first? When can your child begin learning how to sew? As we all know – children are different, so there is no one set age at which each and every one of them will be ready to start learning the basics of stitching and using a machine. There are kids which become interested and are mature enough to be taught from a very early age – as young as 4. Others may not have the skill set to start so early, so you should wait until you feel that they are ready. In any case, the first lessons should be supervised at all times, in order to teach the child how to stay safe and how to handle the sharp needles and scissors properly to avoid mishaps or injuries. In my experience, I have found that while a child as young as 6 will probably need constant supervision, those who are 8 or older can begin working on easy sewing projects suitable for kids unsupervised, after you have taught them the basic skills of sewing and safety. In any case, it is recommended that you ensure that your machine has all necessary safety features to keep the little fingers of the young one protected during the stitching process. Also, you should assist a very young child with the foot pedal while it gets comfortable enough to control the speed of the machine by itself. Should you get your child a toy or the real thing when introducing it to the basics of using a sewing machine? Toy machines may be cute and look like fun, but if you really intend to teach your child the useful skill of sewing, I strongly recommend that you opt for the real thing when getting them their first machine. There are various small and safer machines which are very suitable for newbies and for young children, and yet have all the basic functions and stitches necessary for them to learn how to complete some simple and more complicated projects. What kind of sewing machine is suitable for children? It should be fitted with the safety features which are necessary to protect your child’s fingers and hands from the needle. It will help if the body of the machine has a fun, child friendly design and keeps the child interested. It should have an easy speed control option, rather than foot pedal control only, because learning how to control the speed of the stitching with feet can be quite challenging for young children. Automatic needle threading is definitely something to opt for. What are the sewing terms which the child should learn from day one? Even though your children may find the theoretical part of the sewing lessons boring, it is essential for their safety that you teach them the basic sewing terms, such as: seam, wrong side, right side, as well as how to thread. You should also start by teaching the child how to thread and use a normal needle as well. Teaching a child how to use a machine requires that it is familiar with the basic parts of the machine, so make sure you take the time to show your child which part is used for what and what the names of the main parts of the machine are. Which stitches should the child learn first? Straight stitch – this it he most commonly used stitch, so start with it. Back stitch – show them how to do this one when the fabric is stretched along the seam. Lock stitch – this stitch is essential for the kid to be able to make invisible knots at the beginning and end of a stitch. After your child becomes comfortable with the basic stitches, you can move to more complicated ones, such as: overcasting and zigzag as well. As the child progresses you can introduce it to more stitch types and patterns.